This phrase has become a widely quoted summary of the relationship between Christianity, secular government, and society. The original message, coming in response to a question of whether it was lawful for Jews to pay taxes to Caesar, gives rise to multiple possible interpretations about the circumstances under which it is desirable for the Christian to submit to earthly authority. All three synoptic gospels state that hostile questioners tried to trap Jesus into taking an explicit and dangerous stand on whether Jews should or should not pay taxes to the Roman authorities. The accounts in Matthew 22:15-22 and Mark 12:13-17 say that the questioners were Pharisees and Herodians, while Luke 20:20-26 says only that they were "spies" sent by "teachers of the law and the chief priests". The questioners were impressed. Matthew 22:22 states that they "marveled" (ἐθαύμασαν) and being satisfied with the answer, they went away. A denarius featuring Tiberius. The inscription on the obverse reads Ti[berivs] Caesar Divi Avg[vsti] F[ilivs] Avgvstvs ("Caesar Augustus Tiberius, son of the Divine Augustus"). However, it has been suggested that denarii were not in common circulation in Judaea during Jesus' lifetime and that the coin may have instead been an Antiochan tetradrachm bearing the head of Tiberius, with Augustus on the reverse. Another suggestion often made is the denarius of Augustus with Caius and Lucius on the reverse, while coins of Julius Caesar, Mark Antony, and Germanicus are all considered possibilities. Whichever Roman coin it was, the fact that Jesus's interrogators had an idolatrous coin with its "graven image"  of whomever, and in the Temple precincts  no less, immediately convicted them of blasphemy and put Jesus at a rhetorical advantage. A similar episode occurs in the Gospel of Thomas (verse 100), but there the coin in question is gold. Jesus responds to Pontius Pilate about the nature of his kingdom: "My kingdom is not of this world. If my kingdom were of this world, my servants would have been fighting, that I might not be delivered over to the Jews. But now (or 'as it is') my kingdom is not from the world" (John 18:36); i.e., his religious teachings were separate from earthly political activity. This reflects a traditional division in Christian thought by which state and church have separate spheres of influence. A more simple explanation is that quite literally the people were not yet of his kingdom for if they were, the servants would rise up against the obvious injustice for convicting an innocent man. Not only the complete misunderstanding of Christ's teaching, but also a complete unwillingness to understand it could have admitted that striking misinterpretation, according to which the words, "To Cæsar the things which are Cæsar's," signify the necessity of obeying Cæsar. In the first place, there is no mention there of obedience; in the second place, if Christ recognized the obligatoriness of paying tribute, and so of obedience, He would have said directly, "Yes, it should be paid;" but He says, "Give to Cæsar what is his, that is, the money, and give your life to God," and with these latter words He not only does not encourage any obedience to power, but, on the contrary, points out that in everything which belongs to God it is not right to obey Cæsar. Christ answered the Herodians according to their condition. "Show me the tribute-money," said he; — and one took a penny out of his pocket; — If you use money which has the image of Caesar on it, and which he has made current and valuable, that is, if you are men of the State, and gladly enjoy the advantages of Caesar's government, then pay him back some of his own when he demands it; "Render therefore to Caesar that which is Caesar's and to God those things which are God's" — leaving them no wiser than before as to which was which; for they did not wish to know. They come to him and interrogate him as a way of putting him to the test. They ask, "Teacher, Jesus, we know that you are [from God], since the things you do put you above all the prophets. Tell us, then, is it permissible to pay to rulers what is due them? Should we pay them or not?" Jesus knew what they were up to, and became indignant. Then he said to them, "Why do you pay me lip service as a teacher, but not [do] what I say? How accurately Isaiah prophesied about you when he said, 'This people honors me with their lips, but their heart stays far away from me; their worship of me is empty, [because they insist on teachings that are human] commandments […]'"
↑ "Tiberius, Tribute Penny". Retrieved 7 September 2011. ↑ Lewis, Peter E.; Bolden, Ron (2002). The Pocket Guide to Saint Paul: Coins Encountered by the Apostle on his Travels. Wakefield Press. p. 19. ISBN 1-86254-562-6. ↑ Michael E. Marotta (2001). "Six Caesars Of The Tribute Penny". Retrieved 7 Sep 2011. ↑ Brown, John The law of Christ respecting civil obedience, especially in the payment of tribute (London: William Ball, 1839) 3rd. ed, p. 183 "It is as if our Lord had said, 'The common circulation of Caesar′s coin among you, shows that you stand in a certain relation to him as your ruler. Perform all the duties which are due to him in that relation'"
↑ Taxpayers Who Fail to File Federal Income Tax Returns: Hearing Before the Subcommittee on Oversight of the Committee on Ways and Means, House of Representatives, One Hundred Third Congress, First Session, October 26, 1993. United States Government Printing Office. 1994. p. 154. ISBN 0160440769. Archived from the original (PDF) on 28 August 2012. ↑ from The Writings of Tertullian. vol. I, ed. by Alexander Roberts and James Donaldson (Edinburgh: T.&T. Clark, 1869) p. 164. 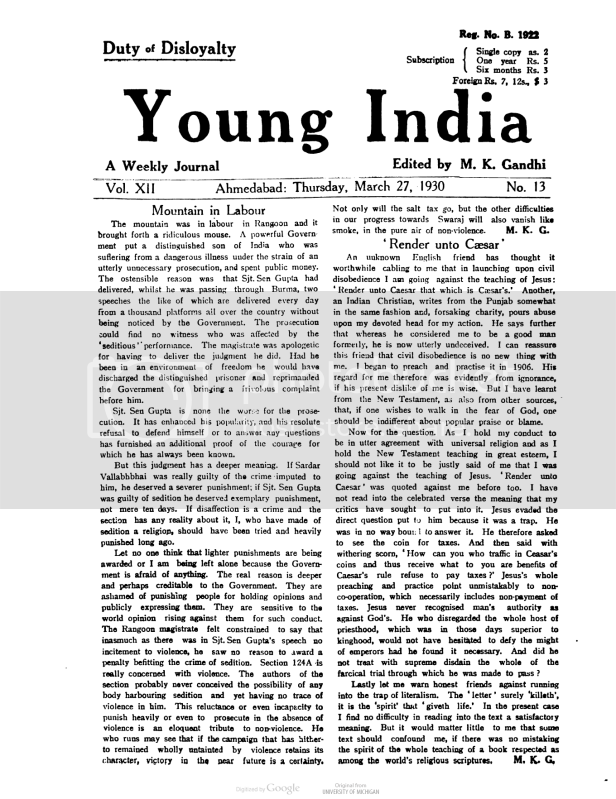 ↑ The Collected Works of Mahatma Gandhi (PDF). 48. 1998 . p. 483. ↑ Gross, David M. (Apr 2, 2008). We Won't Pay! : A Tax Resistance Reader. CreateSpace. p. 373. ISBN 1434898253. ↑ "Ellul, Jacques ''Anarchism and Christianity'' p.20" (PDF). Retrieved 2012-05-07. ↑ "The Gospel of Thomas. Translated by Stephen Patterson and Marvin Meyer".